Justice: Chell fights to escape her imprisonment and the cruel tests forced upon her. Enemy: Among her captors is GLaDOS, a rather frightening AI, and others in Aperture Science. Chell's past remains shrouded in mystery. Evidence suggests that she was adopted by a member of the Aperture Science company, but she doesn't know who or why she was given up for adoption. Chell is a reticent and enigmatic young woman. She says little save when it is needed, and though it's rumored she has a thing for weighted Companion Cubes, Chell has little attachment to anyone or anything except her freedom. A fit woman, Chell is athletic and strong. She also has a head for spatial relationships and thinks quickly. These gifts benefit her use of the Handheld Aperture Device, or "portal gun." With it, she can create portals between two places, and uses this and her natural athleticism to escape imprisonment by otherwise impassable chambers. Last edited by Lara Croft; 07-30-2014 at 12:05 AM. Doing Good: Chun-Li inherited her father's sense of duty and responsibility to uphold the law. Enemy: Bison and Shadaloo. Bison killed her father, and she's made it her personal mission to dismantle his criminal organization of Shadaloo. Honor: Chun-Li has a strong sense of honor, both familial and professional. Responsibility: As one of Interpol's top officers, Chun-Li is called upon for various missions that others can't perform. Chun-Li was always raised a fighter, taught by her father and other masters, such as her father's friend, Master Gen. After her father was killed, Chun-Li went on to become an Interpol investigator to track down his murderer. She found the man responsible, M. Bison, the leader of a criminal organization called Shadaloo. Though Chun-Li confronted Bison, she was defeated and he escaped. With the help of other agents and powerful fighters such as Ryu, Charlie and Guile, Chun-Li went after Shadaloo. They succeeded in bringing the syndicate down, though at the cost of many lives, and as ever, Bison escaped. Chun-Li tracked him down to the second World Warrior tournament, though he was defeated by Akuma before she could realize her revenge. With Bison apparently dead and Shadaloo dismantled, Chun-Li retired, but it would not last long. Guile informed her of Shadaloo's imminent return and Bison's reappearance, along with the mysterious organization called S.I.N. Despite fighting her way deep into the heart of S.I.N. 's base and confronting Gen for answers about her father's death, Chun-Li was unsuccessful in apprehending Bison. However, she was instrumental in the dismantling of S.I.N. Chun-Li continues to fight the good fight and has taken to mentoring children in the martial arts and teaching them courage, good will and kindness. 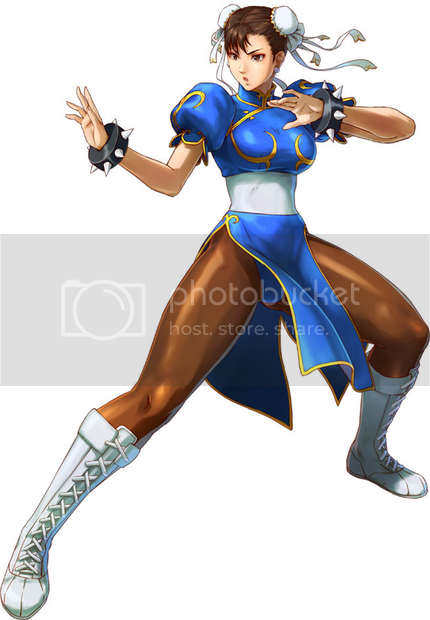 Chun-Li is a cheerful woman with an energetic personality. Though she's every bit the competitor that other fighters are, she is nevertheless happy to fight against skilled opponents and to perform well. Chun-Li does take her job as an Interpol agent seriously, but never succumbs to the grim, dour attitudes many of her compatriots develop. Constantly a source of energy and optimism, Chun-Li's presence always brightens up a situation. A master martial artist, Chun-Li's greatest strength is in her speed. She's incredibly fast and accurate in melee, delivering her trademark series of lightning-kicks in a devastating barrage. Her lower body strength also allows her to leap and run very quickly, giving her an edge in mobility over most of her foes. Her skills place her among the top fighters in the world, allowing her to defeat nearly any foe in personal combat. Chun-Li has also learned how to draw out and manipulate her chi energy. This lets her project short-range fireballs and larger, explosive attacks, though the latter are draining. When combined with her awesome kicks, Chun-Li's chi power is a force that can overwhelm any enemy. She uses no weapons in her duties as Interpol agent, having no need for them with her personal power. Nice stuff, Lara. I assume Chell is from Portal? I haven't actually played it. Thanks. I try to have my writeups be at least enough info to run a character solely from those, although I don't know if anyone uses them, or otherwise even plays without PL. 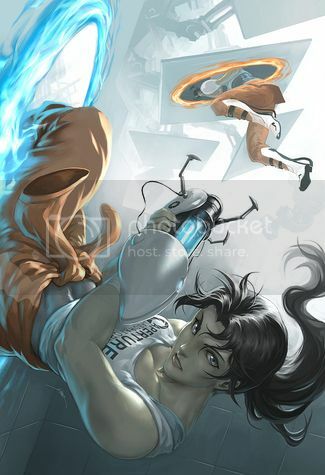 Chell is from Portal, yes. I actually haven't played all the way through either game because I've never owned them, but I figured she'd make for an interesting concept with the Portal Gun. Plus, she's a prominent female character in video gaming, so that works well for what I like to do here. I'm not that familiar with Portal (having never played, but friends who do), but I would assume that her ability to open the two portals far from herself would warrant the Ranged modifier on the Teleport power. Hm. Since Teleport has a default Range equal to rank, I figured the Portal Extra just means you open up a portal within range. I could always add Increased Range to the power if need be. That "Range" is meant to be the limit of how far away your "end-location" is from where you are. If you want to open up the Portal someplace other than yourself, you would need the Increased Range extra. Which also means that the Check Required you have means little, as you'd need a ranged attack check to aim the "Portal attack" anyways. Yay, simplicity! On the other hand, if I'm not mistaken the Portal Gun requires you to also shoot your "end-location" (that is, you need to establish both you entrance and exit portals by accurately hitting those places with the gun). I'd say needing two actions to set up the portals compensates the cost of being able to shoot the initial portal at a range, so the Point cost wouldn't change much. But yeah, the Check Required flaw is probably superfluous with the Attack modifier in there. Updated the build. How's it look now? "Yes, if you make a pass at me again, I will bite your head off." Justice: Maya wants revenge on Oscorp/Alchemax for what they did to her, and similar organizations. Enemy: Alchemax and its Goblins, as well as much of New York's organized crime. Quirk: Maya struggles with alien instincts and a cold detachment from her humanity. She is slowly regaining pieces of herself, but often behaves with the cold calculation of an insectile predator, and feels little compassion for her prey. Maya Marsden was a gifted biologist working for Oscorp, later merged into Alchemax. Her research into animal-based medicines and advancements helped pave the way for strengthening humanity against infirmity. She specialized in entomology (and happened to favor the Mantodae family), seeking to exploit the endless adaptability and strength of the insect kingdom to help people improve reflexes, restore damaged limbs or fight off toxins. What Maya didn't realize was that Alchemax used her work for its super-soldier hybridization programs, seeking to create an army of loyal soldiers. Working late one night, she discovered the truth when an experiment gone awry disabled the security and one of the failed subjects escaped. Maya followed its trail of destruction down to one of the hidden special projects labs and discovered the truth—but Alan Cowell, the head of the program, discovered her. When Maya confronted him, Cowell realized he couldn't let her go, so he turned her into the test subject for her own work, then systematically erased her Alchemax identity. Cowell was a man with vision, but not always the most intelligent—after Maya's successful hybridization (and realization that certain DNA was more compatible than others) with the mantis profile, she escaped his clutches and managed to take much of her work with her. Alchemax struck back by attacking Maya's home, stealing any notes she had left and completely ransacking the place. They also had Maya declared dead, slain in a failed attempt to steal corporate secrets that also cost her coworker's life. Forced into hiding, Maya purchased a fake identity for herself and cobbled together a costume based on various mantid designs. She began a guerilla-war against Alchemax and the other corporations like them, exploiting the honest intentions of good people, seeking revenge on Cowell. While she has managed to disrupt their operations, her actions brought her into conflict with Spider-Man on the night she'd finally cornered Cowell with the intent to kill him. Their battle ended when one of Cowell's experimental subjects attacked, forcing Mantis to choose between helping him and killing Cowell. She chose to help Spider-Man, and in the aftermath he realized she was lost, alone, seeking her way with the newfound responsibility of knowledge and ability. Spider-Man knew that perspective well and offered to help, and although Mantis declined, she earned Spider-Man's respect. 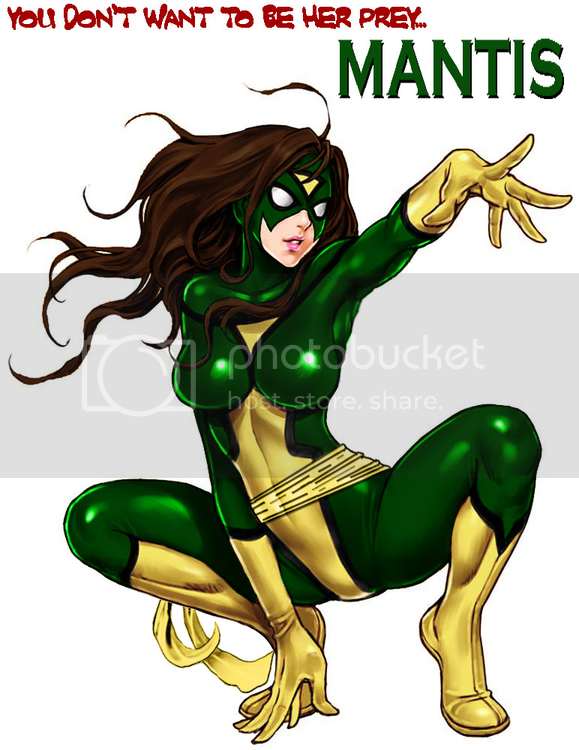 Since then, Mantis has crossed paths with the forces of Alchemax, with Spider-Man and his rogues gallery many times. She strikes out against corporations like Alchemax and continues to struggle with finding her own humanity. Since the hybridization process, Maya has become cold and calculating, much like an insect. She evaluates people and situations through instinctive terms: food, threat, non-threat, and similar categories. When she feels emotion at all it is muted, and often consists of sorrow, lamenting her humanity. Alchemax took her life away, legally and in the transformation, and she is now lost and lonely, unable to fit in anywhere or start over until Alchemax is destroyed. May has little reservation about hurting those who wronged her, but perhaps somewhere deep down is the optimistic idealist who once sought to uplift people, rather than tear them down. The experiment that transformed her gifted Maya with a praying mantis' physical characteristics, proportionate to the human form. She has superhuman strength great enough to lift cars and rip through steel, and her stamina surpasses the finest human athlete's. Most of all, her reflexes and agility have increased to greatly superhuman levels, allowing Maya to move faster than human eyes can follow and providing her with flexibility to make the best contortionists envious. She also gained an array of superhuman senses, both in sight and hearing, giving her far greater awareness than a normal human. With her speed came new methods of mobility: like mantids and other insects, Maya can cling to walls or even ceilings by her hands and feet. She possesses a natural aptitude for finding the best possible location to blend in and escape notice, and she can fly for short distances like a mantis. This speed and strength and overwhelming instinct combine into a fighting style that is fast and powerful, making her a match in combat even for the likes of Spider-Man. She is inexperienced, having led a primarily academic life, relying on her powers and sheer speed to overwhelm more experienced foes.